Caregiving is both a vocation and an avocation for many women and men who find themselves caring for the parents, relatives or children who need them. Caregivers in San Diego have access to resources and support through the County of San Diego, through philanthropic organizations, and through local hospitals and foundations. 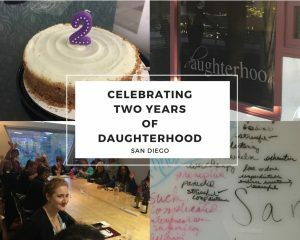 Two local women brought their vision of another kind of group to the caregivers of San Diego with the Daughterhood circle, and this week we celebrate its second anniversary. This milestone celebration featured special guest Dr. Rhoberta Shaler, a relationship consultant, speaker, and author, who works with the partners, exes, adult children, and coworkers of relentlessly difficult people, aka “Hijackals™. She offered the insights, strategies, and support needed to reclaim hope, confidence—and sanity—when dealing with the constant uncertainty and jaw-dropping behaviors of Hijackals at home, at work, and especially as caregivers. The Daughterhood San Diego circle welcomed a ‘sold-out’ crowd at their anniversary celebration, filling the room at their usual meeting place in Mission Valley. The San Diego circle meets every other month, and has occasionally hosted speakers on, for example, California’s 2016 ‘Right to Die’ law, medical marijuana, and self-care for caregivers. Most of the meetings offer women and men a place to discuss the ‘daughterhood experience’, which is both real and universal. In the private group, issues such as the effect of caregiving on women’s heath, the toll on emotional well-being, and the impact on women’s careers are discussed. When they launched the circle, Christine and Karen hoped “that Daughterhood San Diego will function much like mommy groups who support one another in a fun and inclusive environment through the shared experience of caring for loved ones (not just aging parents – but to include spouses, friends, and family members as well.” The last two years have proven to offer just that to the San Diego circles’ members. The daughterhood concept is spreading, as currently there are seventeen other circles that meet regularly around the country in the Northeast, Southeast, Southwest, and the Midwest. 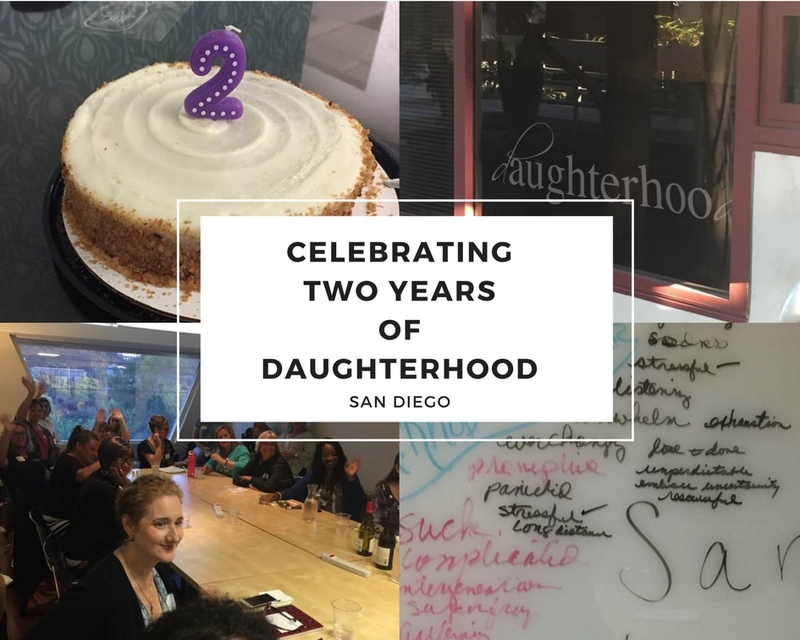 Next week, in the second part of Caregiving in San Diego: Daughterhood San Diego’s Second Anniversary, we’ll learn about the special nature of the Daughterhood circle, and why the circles are growing.